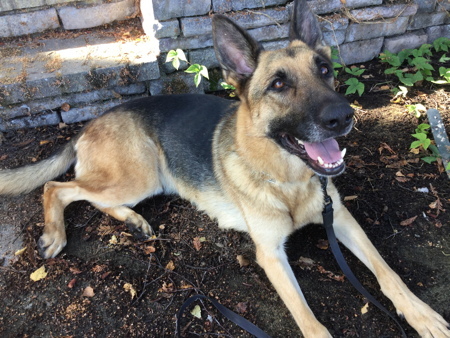 Taz is an approximately two years old, black and tan male weighing 66 lbs. He is an energetic companion dog and has a good appetite. He was surrendered to a Sacramento area shelter, so nothing is known about his past. He is house-trained with the use of a doggy door, and has also been left indoors with the dog door shut and has not had an accident in the house. He heels and walks nicely on a leash, only getting excited when other dogs bark at him. 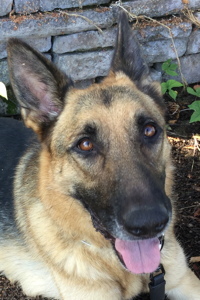 He gets along well with the other German Shepherds of various ages in his foster home, but he can get antsy sometimes when he is out-and-about if there are a lot of other dogs around. He is a flexible boy; he loves to sleep on the dog bed next to his foster mom, but he will also sleep quietly in a crate. While he will sleep in a crate, he does not like to be contained in a crate or kennel. 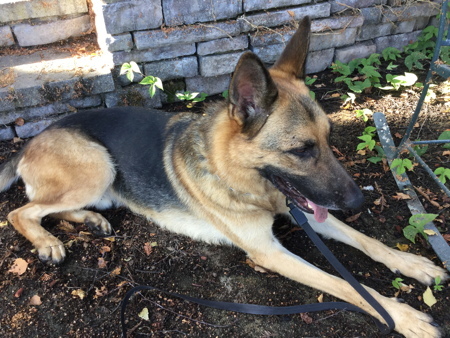 He has shown skill in escaping a crate, kennel, and even scaled a 6' fence when left alone too long, so he will do best in a home with another dog and secure fencing and/or someone home most of the time. At his current foster home, he is left free in the house when his humans are gone and he does very well, but don't leave food on the counter. Taz can be a bit uncertain in new environments and situations, but once he is comfortable he is extremely affectionate and easy-going. He occasionally gets excited and jumps, so a home with small children is not recommended. He has playful moments with the other dogs, but for the most part is happiest following his human around the house. He loves walks and car rides, and he would love nothing more than to be an active part of the household. He has learned to sit and wait for his food as well as basic commands, but additional training and socialization will help Taz reach his full potential. No cats, small dogs, or small critters!! !